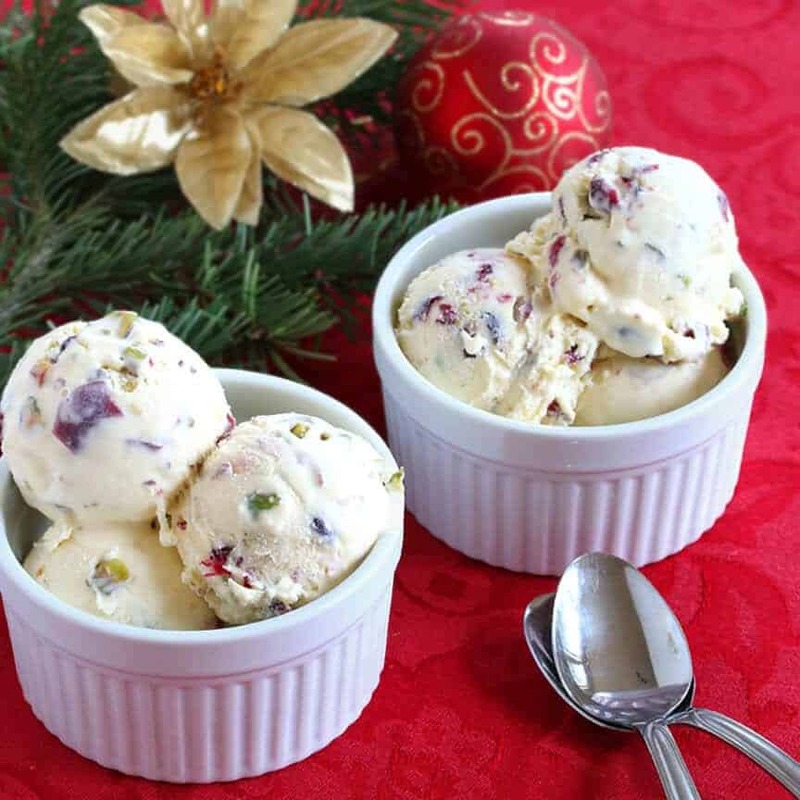 A deliciously rich white chocolate ice cream studded with pistachios and cranberries. It’s the three traditional Christmas colors wrapped up in one incredible-tasting ice cream! My husband and I were destined to love ice cream. We both come from a family of ice cream lovers. Coincidentally, it was both sets of our grandfathers who were especially passionate about ice cream. Among other things, they all shared in common a love of ice cream and a strong work ethic. Todd’s grandfather, Joseph, grew up humble and had only an 8th grade education. But he was one of the most intelligent men Todd ever knew and he had a work ethic equal to it. Through hard work in the construction line of business he became a self-made millionaire in Alaska by the time he was 50. But you would never know it, because he was the kind of man who would wear the same pair of boots until the soles had holes, then he’d take them in to get repaired. He lived by the old Great Depression adage, “use it up, wear it out, make it do or do without.” One of his most favorite indulgences was milkshakes and he took every opportunity to take Todd with him to get one. My German grandparents endured tremendous hardships during and after WWII, and in many ways you could say they led lives of quiet heroism. But despite their earlier years of hardship they never lost their love for life or their sense of humor. My Opa Heinz’ favorite edible luxury was ice cream. It was tradition every time we visited my grandparents in Stuttgart that we brought my Opa ice cream. Before the ice cream even made it to the freezer he would eagerly scoop out a serving into a bowl, sit down with a spoon, and slip away into silent ecstasy for the next 15 minutes while the rest of us mingled with our Oma. If you’re a baseball fan you’ve probably heard of my husband’s other grandfather, Baseball Hall of Famer Harmon Killebrew. Though nicknamed “the Killer” for his incredible batting power, he was one of the most gentle souls you ever met. When he was on the road during game season he would go back to his hotel room and unwind by removing the lid from a quart of ice cream and going at it with a spoon. He could finish off the entire thing with ease. My American grandpa, Leonard, lived until he was 92 years old. Raised on a farm with a work ethic that remained with him until his final moments, he became a mechanic and worked in the coal mines of southern Utah. Even in his 90’s he got up early every morning and found a way to keep himself productive, mostly outside in his beautiful fruit orchard, the best kept property in town. Even a decade since my grandma’s passing he still grew a huge vegetable garden every year that he tended by himself. Even in his final year, battling cancer and chemo, he didn’t let anything keep him from his work. And at the end of the day you could find him in the family room in his oversized stuffed chair with a fudge stick or bowl of ice cream. I’m sharing a truly scrumptious ice cream recipe with you today that was inspired by some cookies I developed for Christmas a few years ago and that have remained super popular across the web: My White Chocolate Pistachio Cranberry Cookies. I wanted to create a cookie that featured the three traditional Christmas colors (without food coloring). White chocolate was a given, dried cranberries or cherries were perfect for the red, and pistachios are not only green but are one of my favorite nuts. Now, a few Christmases later, I wanted to develop an ice cream along the same theme. White Chocolate Cranberry & Pistachio Ice Cream. And so we have a deliciously rich white chocolate ice cream base that’s studded with pistachios and cranberries. The result: You simply have to try it otherwise you won’t believe me how fabulous it is! So this ice cream celebrates Christmas and four truly remarkable men. I wish they were all still here to enjoy it. But if there’s an ice cream maker in heaven, I’ll make it for them when I get there. For this recipe we add the cranberries and pistachios in very last instead of simmering them in the custard. There are two reasons for that: Color and Flavor. Color: Simmering the cranberries in the custard would seep some of their color into the ice cream. Since this ice cream is showcasing the Christmas colors, I wanted to maintain the white ice cream with the red and green flecks. Flavor: The highlight here is the luxuriously rich and creamy white chocolate ice cream that’s accented by the pistachios and cranberries. Simmering would have leeched more of the other flavors into the ice cream base. When you eat this I want you to be able to distinguish and experience each of the glorious flavors in their own right. You can use any ice cream maker for this recipe. I’m making this ice cream in my Cuisinart ICE-100 Ice Cream and Gelato Maker. We were previously using the Cuisinart ICE-21 for nearly 6 years on a regular basis. It’s still going strong and does an awesome job. But the ICE-100 is a compressor ice cream maker, meaning you don’t have to freeze the ice cream bowl in advance. Just plug the machine in, add the ingredients, and wait for the ice cream. We love it! Take a moment to watch our jazzy Christmas video featuring the making of today’s ice cream! Whisk together the sugar and egg yolks in a medium bowl. Heat the milk with a tiny pinch of salt up to the point just before it starts boiling – don’t let it boil. It will have formed bubbles. Add a cup or so of the hot liquid to the egg/sugar mixture and whisk constantly until incorporated. Whisk this mixture back into the pot with the milk, whisking constantly until combined. Bring the custard to a simmer, whisking constantly, until thickened enough to coat the back of a wooden spoon. Add the white chocolate and stir until melted. Pour the custard through a fine mesh sieve into a medium mixing bowl. Place plastic wrap over the bowl, pressing it down directly on top of the custard to prevent a hardened film from forming on top. Chill overnight. At this point you will have already soaked the cranberries in water for about 30 minutes and squeezed them as dry as possible. You’ll also have chopped the pistachios. Make sure you chop them coarsely or the fine powder will cause the ice cream to be sandy in texture. The next day whisk in the cold heavy cream. Stir the pistachios and cranberries into the custard. Follow the instructions on your ice cream maker. When the ice cream is done, scoop it into a quart-sized rectangular freezer safe bowl. The shape isn’t necessary, but it lets you have a long runway for scooping. Smooth out the ice cream on top and fit the bowl with the lid. Freeze for 24 hours for best results, it allows the flavors to develop. When you scoop out the ice cream, dip the spoon into hot water between scoops. 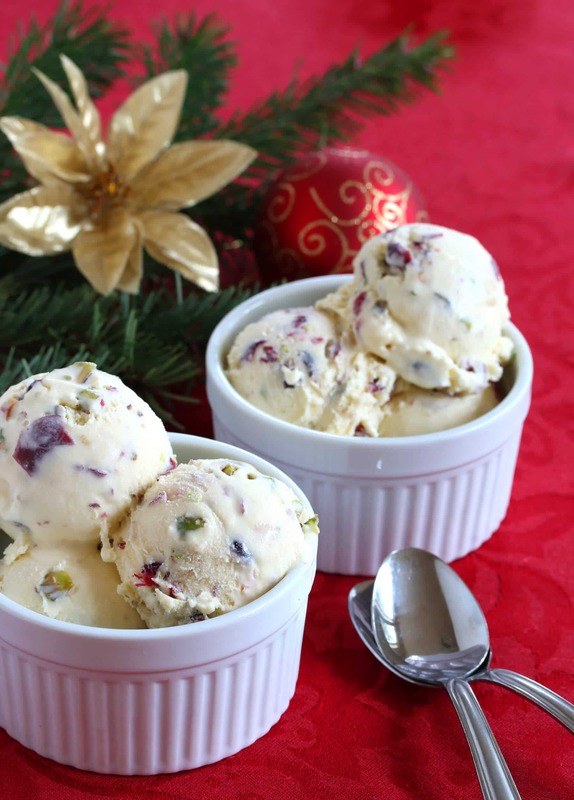 A deliciously rich white chocolate ice cream studded with pistachios and cranberries. It's the three traditional Christmas colors wrapped up in one incredible-tasting ice cream! In a medium mixing bowl, whisk together the eggs yolks and sugar. Set aside. In a medium sauce pan over medium-high heat, heat the milk with the salt until it reaches just before the boiling point. Bubbles will have formed on the surface. Do not let it boil. Whisk about a cup of the hot milk into the egg yolk/sugar mixture and whisk continually until incorporated and smooth. Whisk this mixture back into the pot and whisk continually until combined. Bring the custard to a low simmer, whisking continually, until thickened enough to coat the back of a wooden spoon. Stir in the white chocolate and continue stirring until melted. Pour the custard through a fine mesh sieve into a bowl and cover the bowl with plastic wrap, pressing down onto the surface of the custard to prevent a hard layer from forming on top. Chill in the fridge overnight. The next day stir in the chilled heavy cream, then the pistachios and cranberries. When the ice cream is done, scoop it into a quart-sized rectangle freezer safe container. The shape isn't necessary but it allows you to have a long runway to scoop the ice cream. Smooth the top of the ice cream. Secure the lid and freeze for 24 hours for best results, it allows the flavors to fully develop. 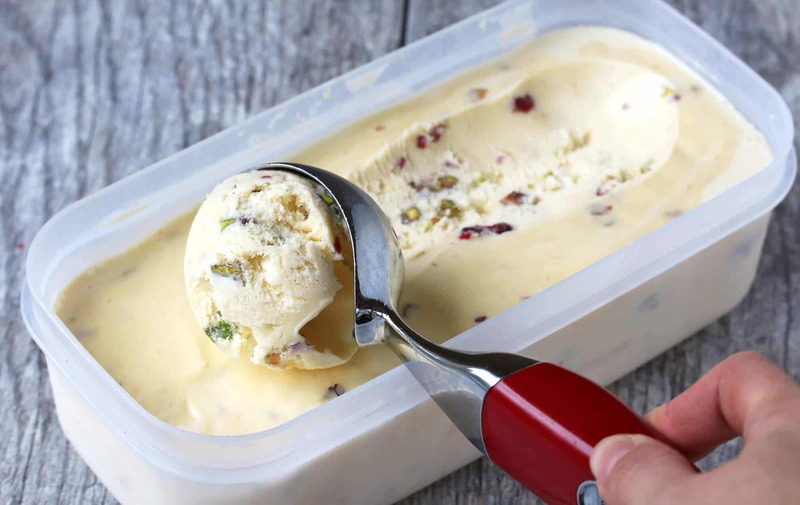 To scoop the ice cream, dip the spoon in hot water in between scoops. Serve immediately. Best eaten within 2 days.Makes 4 quarts. That sounds fantastic! I’ve never owned an ice cream maker but it is something my family would love using! You had me at white chocolate and cranberry and adding pistachio to the mix brings this over the top delish! I totally love this! Pinned, too! Homemade ice cream is the best! I LOVE this cranberry pistachio combo. It’s perfect for the holidays. Wow! 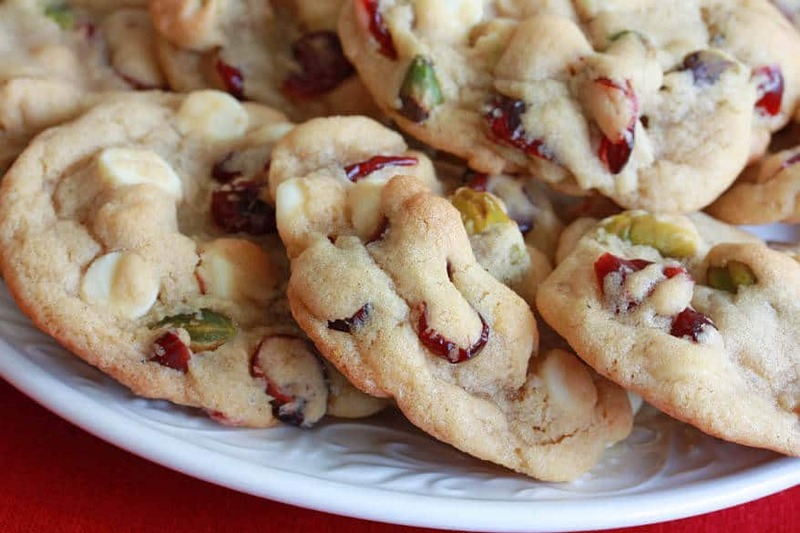 This sounds amazing, love pistachio and cranberries flavor and the white chocolate is genius! Wowza! This is my kind of ice cream! I’m always happy for any excuse to get out the ice cream maker! Thanks for the recipe! I’ve been debating an ice cream maker and this looks like the perfect one! Also this combo of pistachio’s and cranberries is definitely going to have to make an appearance. This takes ice cream to a new level! I love it. The perfect holiday ice cream – love the colors! LOVE ice cream year round, and especially homemade ice cream. :) Love the festive flavors in this one! I love that I have an ice cream maker to be able to make this, it looks fantastic! It sounds as though your husband grew up with two wonderful grandfathers. It’s such a gift to have someone teach a child about work ethic through example. I’ll bet they would both love this ice cream! Best flavor combination ever! I’m totally drooling! I just love every one of your grandfather stories. How sweet of you to develop a festive ice cream recipe in their honor. I make a ton of ice cream. It might just be time to upgrade to an ice cream compressor. Pistachios are one of my favorite nuts as well and I’ve always loved cranberries. White chocolate, however, oh my, how I love the stuff. Since I don’t like its dark cousin, this is definitely top of my sweet list. I’d go crazy for your ice cream. Ice cream is my favorite frozen dessert, and I love to make it at home as well. 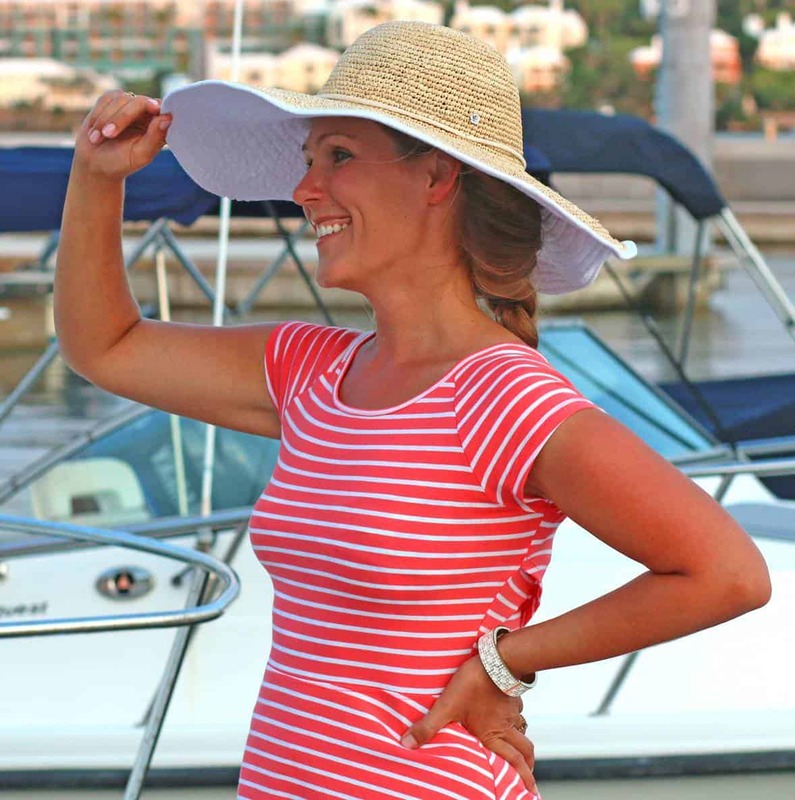 So easy and you can really get creative! Loving the festive flavors and colors here. How many people will this feed????? A quart is 4 cups, so this will feed 4-6 people. What a delicious Christmas ice cream this is! Everyone loved it and I can’t wait to make it part of my Christmas cooking tradition! I asked my sister what she wanted for Christmas and she said more ice cream please! Very festive with the red cranberries and green pistachios. Wonderful! I’m so glad it was a hit, Melissa, thank you!